Figure 6-39. - Air compressor pistons: A. Trunk type; B. Differential type. driven from a reciprocating or rotary part of the compressor. Oil is fed from the cylinder lubricator by separate lines to each cylinder. A check valve is installed at the end of each feed line to keep the compressed air from forcing the oil back into the lubricator. The oil is distributed to the top of each main bearing, to spring nozzles for reduction gears, and to outboard bearings. The crankshaft is drilled so oil fed to the main bearings is picked up at the main bearing journals and carried to the crank journals. The connecting rods contain passages that conduct lubricating oil from the crank bearings up to the piston pin bushings. As oil leaks out from the various bearings, it drips back into the oil sump (in the base of the compressor) and is recirculated. Oil from the outboard bearings is carried back to the stirrup by the drain lines. 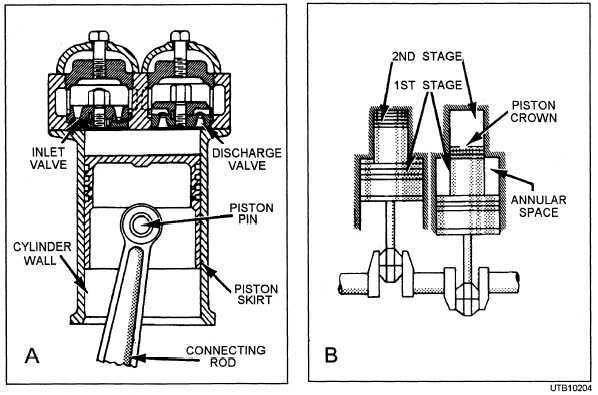 Low-pressure air compressor lubrication is shown in figure 6-40. This system is similar to the running gear lubrication system or the high-pressure air compressor. Nonlubricated reciprocating compressors have lubricated running gears (shaft and bearings) but no lubrication for the pistons and valves. This design produces oil-free air. The lubrication chart in the operator's manual for the make and model of compressor you are operating shows you where the unit should be lubricated, how often to lubricate, and what lubricant to use. The frequency depends upon operating conditions. Operating under abnormal conditions requires more frequent service. BEFORE SERVICING THE COMPRESSOR AIR SYSTEM OR COMPRESSOR OIL SYSTEM, OPEN THE SERVICE VALVES TO THE ATMOSPHERE TO RELIEVE ALL PRESSURE IN THE SYSTEMS.